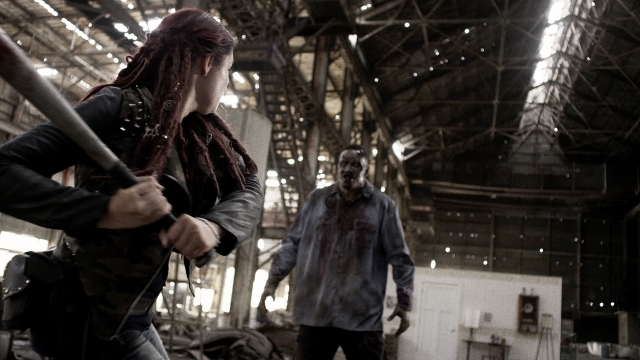 Mack and Addy have, so far, been the Romeo and Juliet of Z Nation. Young, in love and, considering it’s the apocalypse, probably just as doomed. The pair got separated from the main group a few episodes back. This episode catches us up with what they’ve been doing and delves into the crippling flashbacks Addy has been having all season, flashbacks that are somehow tied to the gold butterfly necklace she always wears. Mack and Addy have made it to Utah, trying to catch Warren’s group as they continue to take Murphy to California to try to see if the antibodies in his blood can be used to create a cure for the zombie virus. If California still exists as mega-herds of zombies sweep the west. At the direction of Citizen Z Addy and Mack have been heading south and west in the hopes of intersecting with Warren’s group. We catch up with the pair as they’re relaxing in a beautiful shady spot by a spring in the woods. Their relationship is becoming increasingly strained as Addy grows more distant because of the violent visions that have been haunting her. Addy wants to stay at the shady spot, but Mack makes her leave, saying she should know that beauty attracts danger. So instead they go to an apocalyptic camp in a bombed out nearby town. Addy also opens up about her visions, which she says involve Mack, maybe, fighting an incredibly tough Z that just won’t die. They’re fuzzy and she’s uncertain. Mack’s attempts to patch up the relationship just get him dumped, at least emotionally. Addy tells him they’ve been together since the first night of the outbreak, which she doesn’t really remember, but they’ve got nothing in common. They kill, they survive and they screw. That’s it. Mack isn’t a quitter. He gets down one one knee and makes a proposal, asking Addy if she’ll go out on a date with him. They have never actually been on a date. Mack’s romantic date includes putting together a plate with their remaining jerky, seeds and bottled water. But when he brings it back to Addy she’s asleep on her side of the camp. So Mack dozes off too. He wakes up and Addy is gone. He hears her yell for help and grabs his machete to go look for her in the ruined city. Along the way Mack sees a giant Z stalking around. It has Addy’s signature spiked metal baseball bat, the Z-Whacker, stuck in its chest and Addy’s butterfly necklace stuck in its mouth. Mack also encounters a snake in a tunnel. He fights the Z, but he’s distracted by the sound of a hawk and a huge piece of concrete comes down and crushes him. The Z finishes him off by ripping out his throat. Mack wakes up. He thinks it was just a dream, but he hears Addy yell again. Mack follows the same sequence of events, but this time before the hawk calls he leads the zombie under the concrete and it crushes it instead. Unfortunately the Z is super strong, so it just throws it off and chases Mack to his death. The first half of the episode is mostly an amusing Groundhog Day like pattern of events where Mack tries the same scenario over and over, getting killed, waking up, noting his mistake, and trying again. The funniest part is where at one point he figures out that he can avoid the Z and avoid getting impaled by rebar if he jumps off a railing just a foot to the right of where he jumped before. It takes a few tries to get it right, though. Eventually he gets good enough to get to his goal, which is an industrial space with a very out-of-place interior wall from a suburban house with a door in the middle just sitting out in the open. The big Z really doesn’t want Mack to go inside there, and kills him before he can get inside. The next time Mack wakes up, Addy is there and wakes up too. Addy is worried that Mack is sick or going insane. To prove that something important is happening takes her through the steps of his repeating dream, but it’s different this time. The snake isn’t there, the concrete has already fallen, the big Z doesn’t make an appearance. However, the bird does call, and the wall is there waiting for them. Mack knows whatever is inside is bad, he doesn’t want to go near it. But Addy is fascinated. She opens the door and it’s boarded up. She tries to knock the boards down with her Z-Whacker. Mack takes it from her to help and knocks some out. He looks inside but can’t really make it out because it’s so dark. And then the Big Z comes running, grabs Addy and bites her throat out. Mack fights but the Z gets Addy’s Z-Whacker and bashes his skull in. Mack wakes up again. This time he doesn’t even take his gun and machete. He just runs as fast as he can to the door. The big Z is standing there, but Mack ignores it and opens the door. This time there’s a staircase inside which he descends, and it becomes a flashback to a younger Mack wearing a high school letter jacket. The stairs lead into a basement. In the basement is a young boy with red hair. He’s holding a knife and bleeding to death from a wound to his neck. “It bit me,” the boy says. Mack is attacked by the giant Z. He stabs it with the knife over and over again in the stomach, yelling “Why won’t you die!” until it falls on him and accidentally takes the knife to the eye and dies. Mack sees the bloody butterfly necklace in his hand. And then Addy wakes him up, saying he was screaming “Why won’t you die!” in his sleep. Mack seems about to confess something about the dream to Addy, but instead he just grabs and holds the butterfly necklace around her neck. “Where did this come from?” Mack asks. Cue Addy waking up. She doesn’t bother to wake Mack this time. She grabs her Z-Whacker and heads directly to the door. The big Z tries to stop her but as she says to herself she’s “not afraid” and she takes him out with a brutal blow to the head. Addy goes downstairs and, like Mack, transforms into a younger version of herself in a letter jacket. She encounters the boy with red hair and takes the knife. She and calls for Mack’s help but he doesn’t come. Then a zombie woman in a housecoat come out of the shadows. Addy asks “Are you infected?” but of course the Z doesn’t answer. Just like Mack she stabs it over and over again in the guts screaming “Why won’t you die?” until it accidentally falls on her and takes the knife to the eye. Addy is holding the bloody necklace as she breaks down in tears. Mack wakes up, still at the shady spot near the river. He looks well-rested and untroubled. He hears Addy call for him. Mack grabs the Z-Whacker and runs to her. He finds her crying by the river. Addy explains through her tears that she’s sorry that “all this time I thought it was you” in the vision. “Oh my god it was me!” she cries. She says the first night of the infection she didn’t know that you had to destroy the brain, that’s why she stabbed her first Z over and over and over. “I killed her Mack. Oh my God forgive me. I killed my mom,” she says, and cries on Mack’s shoulder. End of episode. Discuss the episode in our forum.